Remember Occupy Portland in 2011? Remember when thousands of protesters back in 2011 marched in Portland? Protesters who on the first day marched into Pioneer Courthouse Square chanting “Whose square? Our square!” The protests were joined by labor unions and were held without a permit, even though the City of Portland and the Portland Police Bureau had reached out beforehand and encouraged organizers to please get a permit. 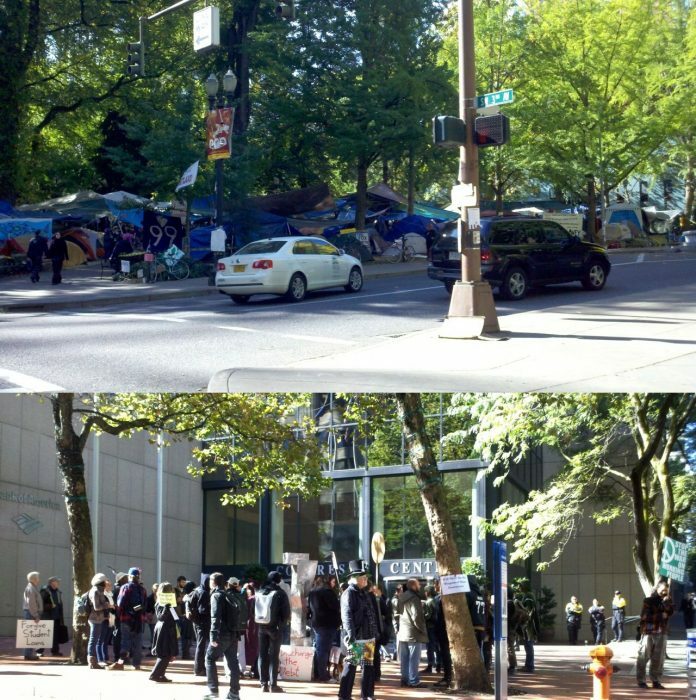 Remember when the protesters set up illegal camps for weeks in downtown Portland? Some of that illegal camping was on federal property. Remember when Obama administration officials, in communication with the White House, told the federal police commander in Portland to stand down regarding Occupy Portland protesters camping illegally on federal property in Portland? Remember when filmmaker Michael Moore visited the Occupy Portland protests and spoke to them on federal land (Terry Schrunk Plaza)? Remember when an Occupy Portland protester was arrested for throwing a Molotov cocktail at Portland’s World Trade Center? Remember when another Occupy Portland protester was arrested for meth possession and carrying a concealed weapon (knife)? Remember when police arrested 51 people in one day while clearing the parks? The illegal camping in the parks was ended due to “unhealthy conditions and the encampment’s attraction of drug users and thieves,” according to then Portland Mayor Sam Adams. Remember when police arrested two Occupy Portland protesters who had “camouflage clothing with a gun, sword and walkie-talkies?” The two were doing reconnaissance for a planned demonstration at the Port of Portland. Occupy Portland coming to an end?